Just few days back, we seen roars of Little Master against Australia and now Rahul Dravid holding the wall against Sri Lanka in first test cricket with a brilliant innings of 177, which crafted Indian’s second best test score in one day (Highest is just one run more 386). With more than 11,000 runs in tests, he is also the fifth highest run scorer as far as test cricket is concerned. We really feel that how blessed and proud are we, when we were having the trio Sachin, Sourav and Dravid in full glory once. Rahul Sharad Dravid, the most experienced test player of Indian: I really don’t know, how many times, media has been written off him, how many times, he might had faced the anger of cricket fans for slow cricket, but he still has kept his reputation as the Wall due to his ability to bat for long durations and we regard him for the same when we got struck by such a need like today’s game. India was competely struggling with a poor score like 32/4, when the big names like Sachin, Sehwag, VVS Laxman and Gambhir were off the screen. But the wall was still in tact and so the hopes. First he taken heat over his shoulders along with Yuvi and finally the skipper moved in with him to turn the match towards Indian’s favour. As of now, Dhoni also has departed before the end of play for today and The wall is on crease with Harbhajan. The Wall; we salute your experience and as a viewer said you are really making cricketing poetry in the ground. 🙂 I was really looking for his double century this time, but …. anyway, we got to see Test Cricket after a while and you really made it a treat for us. Thanks The Wall!!!! 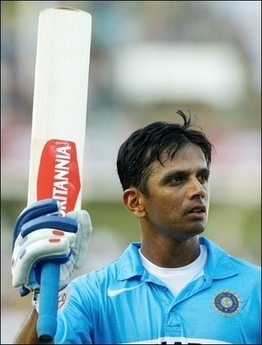 Thanks Dravid!!! !